Note from Jeanie: Oh, hello there. Jeanie here. 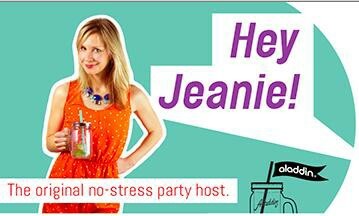 I’m here to show you how to stress less and party more. I tried the whole perfection thing and frankly, I’m over it. Over the next couple of months I’ll be introducing some of my favorite bloggers from around the web to give you quick, easy ways to entertain for every occasion. In this installment, I’m super excited to introduce Meredith Heil from the lovely Beerded Ladies blog. She’s basically the queen of all things Beer. Plus, she hangs out with the coolest dogs in town. I mean just LOOK at him. April! Spring is somehow upon us again. After a long and merciless winter, we emerge from our Netflix-saturated living rooms, mole children slipping off our hoods in search of greenery and warm sun. We rejoice in spring. Let’s party! 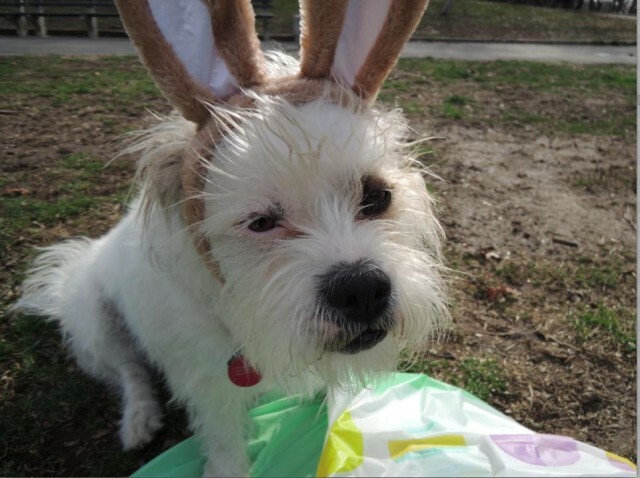 Anyone who successfully survived winter could use an excuse to celebrate, and Easter happens to fall on what promises to be the first pleasant few weeks in recent memory. 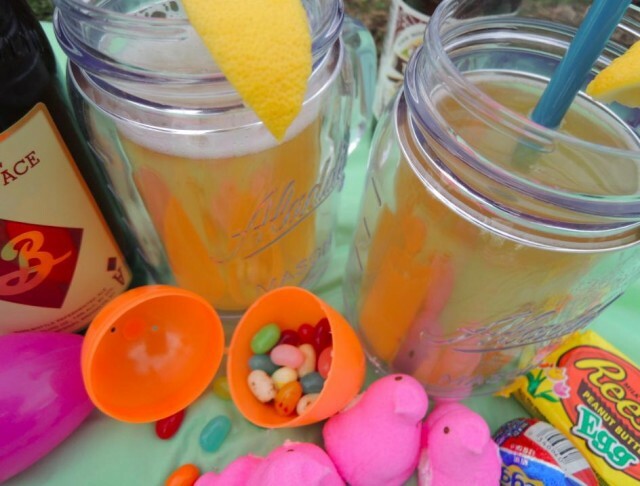 Easter is the perfect excuse to gather your buddies young and old and hit the nearest park for an afternoon of sweet tooth, pastel-hued festivities. On the menu? Beer cocktails, finger foods and a friendly game of kickball, fit for kids of all ages. So grab a blanket and a pair of sneakers — you’ll be ushering in the season in style with these crowd-pleasing tips. Saisons are my absolute favorite warm weather beer. They are beloved for their fruity, spicy and effervescent character, making them the ideal picnic beer. Got some beer skeptics at your party? Give this super simple spring cocktail a try — it brings out a Saison’s signature spicy sweetness but tempers any beer-y-ness with a dousing of fresh, tart lemonade. Also, it looks down right pretty in a mason cup. In a small pot, dissolve the sugar in ¾ cup water over medium heat, stirring constantly for about one minute. Transfer the simple syrup to the fridge and chill until cool to the touch, at least 10 minutes. In a small pitcher, combine simple syrup and lemon juice, stirring until fully combined. Fill 8 mason jars with cold Saison and top with the lemon mixture, about a ¼ cup for each glass. Garnish with a lemon wedge or wheel and drink up! Once you’ve gotten your guests nice and liquored up, let the games begin! Even the most un-athletic of partygoers can get down with a little schoolyard kickball. Commandeer the nearest sun drenched baseball diamond, pick teams and spread out — all you need is a few more beers, a trusty rubber ball and a little chutzpah, and you’ve got yourself a quality party. 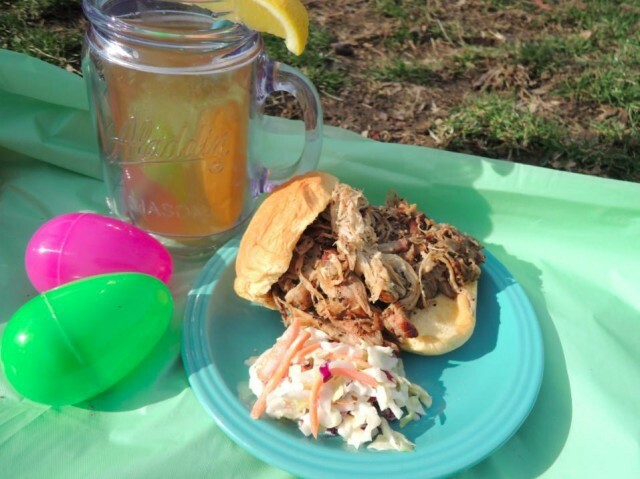 After working up a sweat on the kickball field, it’s time to treat your guests to a picnic-style Easter dinner with all the fixings. For this shindig, I’d go with sharable comfort faves like chips and dip, baby carrots, pulled pork sandwiches and deviled eggs — each dish can be prepared ahead of time so you can save your energy for the game. This BBQ pork recipe has never, ever failed me. It even incorporates my favorite ingredient — beer, of course — to give it an extra kick. You can either DIY the BBQ sauce or buy something from the store. This shizz will be gobbled up so fast, you won’t know the difference. Quarter the onions and place them at the bottom of a 6-quart slow cooker. In a small bowl, combine the brown sugar, paprika, salt and pepper, stirring to blend. Rub the spice mixture over the pork roast, making sure to coat all sides. Drop that roast on top of the onions and nestle it in good. Mix ½ cup BBQ sauce with the beer and stir well. Drizzle the sauce over the roast and onions, getting them nice and drunk. Cook the roast on low for 10 to 12 hours, until the meat is fork tender and smells like heaven. Transfer the roast to a casserole dish, reserving the liquid but discarding the onions. Shred the roast with a fork, stirring in the remaining 1 ½ cups of barbecue sauce and, if desired, some of the reserved liquid and more hot sauce. Toss the whole shebang into an Insulated To-Go Container, pick up a bag of starchy buns for serving and cue the smiles. For your last act, lull your sleepy, happy pals into a sugar coma with the most Easter-y part of your Easter party: the candy! 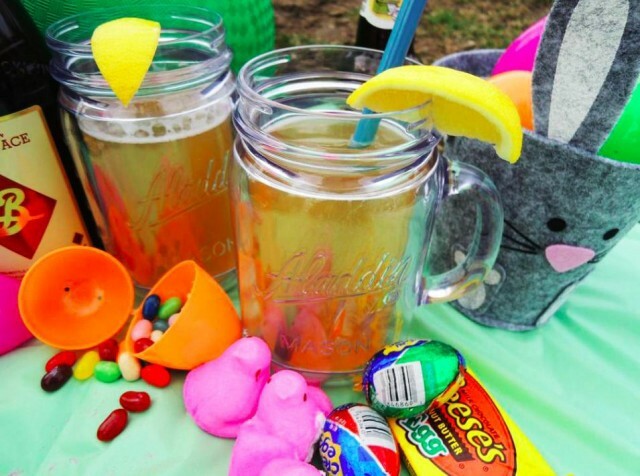 Fill a few colorful plastic bowls with your favorite seasonal treats like jelly beans, chocolate bunnies, pastel M&Ms;, marshmallow Peeps, Cadbury creme eggs — whatever fits your fancy. Lots and lots of fancy, because Easter. And if the competitive spirit still lingers post-kickball, pull out the camera phone and propose a creme egg-eating contest (this is a real thing, like Guinness World Records real…). You might not set any records, but you’ll definitely enjoy trying. As day slips into night, keep the enchanted spring vibe going with DIY glow-in-the-dark Easter eggs! Simply pop some mini glow sticks inside plastic Easter eggs and toss them around your picnic site. How better to wind down your April funfest than with an impromptu Easter rave? Don’t forget to wipe the chocolate from you cheeks and raise a bleary glass to spring — enjoy it now lest she leave us for drippy-hot summer too soon. Cheers!